This tomato jam recipe is easy to make. 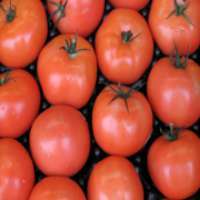 When tomatoes are available in plenty, you are bound to look for tomato recipes. You can make this tomato jam at that time. You can preserve it and use when you want. Select tomatoes that are pulpier. That will reduce the cooking time. You may also use a mixture of pulpy and juicy tomatoes. 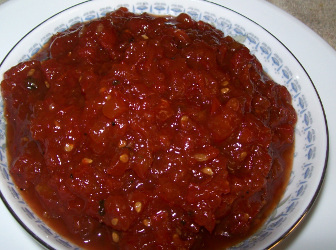 There is no need to remove the seeds and skin from tomatoes for this tomato jam recipe. I feel that adds to taste and consistency. But if you prefer to remove tomato skin, scroll down for instructions to remove tomato skin. Sugar - 1 1/2 cups to 2 cups according to sweetness required. Take a thick bottomed and thick sided pot. Add chopped tomatoes, apple and 1 1/2 cup sugar in it and place on the stove on high heat. Cook and Stir till all the sugar melts. Take it onto a spoon and taste for sweetness. If you want more sweet add more sugar and cook till sugar melts. Add lime juice. Reduce the heat to medium. Add ginger, ground cinnamon and cloves. Continue cooking till it thickens to desired consistency. This may take 30 - 40 minutes more. The time will depend on the pulpiness and the juiciness of your tomatoes. Remember it will thicken a little more when completely cool. Switch off and let the jam cool completely. You can try the following variations for a different taste. add more ginger add garlic paste. add cumin powder. To make a spicy version on tomato jam you may add red chili flakes or red chili powder - 1 tsp or more according to your taste. You can make similar jam recipes with other fruits. Do use this tomato jam recipe. Let me know how it came out and if you made any additions. Contact here. How to Remove tomato skins easily? How to blanch tomatoes? Put water in a big pot to boil. Take enough water to cover all the tomatoes. Cut the top slice from the stem side of the tomatoes. Give a cross cut only on the skin of other side of the tomatoes(do not give a deep cut). When the water starts to boil, put all the tomatoes in the water. Switch the heat off. Cover the pot. Leave the tomatoes in the water for 5 minutes. Remove the tomatoes from the hot water and put them in a pot with cold water. Leave for 5 minutes. Take out and now you can peel the skin off the tomatoes very easily by starting at the slit end. Remove skin from all the tomatoes.